When we define parameters in NextReports Designer we can select default values for parameters. These values will be automatically selected in user interface when user runs the report. There are some special cases of reports with a lot of parameters, when the user may want to have more than a group of default values. To allow such functionality, version 5.2 of NextReports Server will bring a new feature : Templates for Parameters' Values. Basically, inside the runtime parameters panel, user will be able to save a template of values or to select a previously saved template to automatically load all values. To save a template, user has to check "Save as" option and to enter a name for the template. Advancing to next step or just finishing will save the values template inside repository. 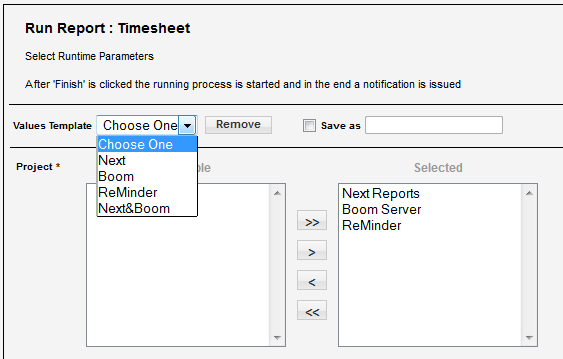 On other runs for same report, user will be able to select the template. Templates can also be removed by selecting them from a list. So, in case you have reports with many (dependent) parameters and you need the way to run more variants without a lot of selecting , start using values templates.